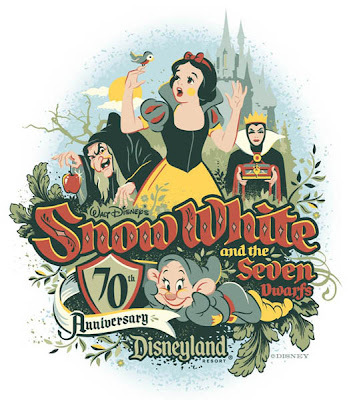 I neglected to mention for all of those Disney Geeks that would be interested, Disney is celebrating the 70th anniversary of "Snow White and the Seven Dwarfs" on November 16th at an event being held at DCA. There will be a number of fan faves on a panel talking about the classic film followed by a screening of the movie and trinkets galore. The panelist include Don Hahn, who will moderate the panel that includes Glen Keane, Roy Disney, Leonard Maltin, Lella Smith, Marge Champion and Uncle John himself! The Poisoned Apple Package - $150, which includes entry into DCA(on 11/16/07 after 2 PM for event only), Snow White's Soiree (Hors d'oeuvres, Dessert and Signature Drink), a Premiere Viewing of the new "The Fairest One of All" Exhibit, the panel Discussion with Pixar Grand Poobah and everyone's favorite Uncle, John Lasseter and all the other big-wigs I mentioned that will be moderated by Disney Animator and Producer, Don Hahn, reserved seating for the special screening at DCA of "Snow White and the Seven Dwarfs" and commemorative trinkets. The Magic Mirror Package - $25, which will include entry into DCA (on 11/16/07 after 5 PM for event only), a special screening in DCA of "Snow White and the Seven Dwarfs" and commerative trinkets. Could be a lot of fun, but ya have to fork over the major dough to see Uncle John and all the legends that'll be there. Hmmm... maybe I'll see you there? I'll be the one in the back with a blue over coat surrounded by guys dressed in shirts that say "Bothan" on them. You could make it a little harder ny having the shirts say "Nahtob"
There've been rumors that Snow White may get a new "Platium" DVD Release someday (with an HD version, a la the possible Sleeping Beauty release coming next year), so my guess is this will likely be taped for inclusion in that, whenever that gets released. I just hope they don't chop it up too much a-la the Aladdin gathering in the Hyperion. I wonder why Ollie's not mentioned, or maybe they're saving that for a surprise?